The US is the last country in the world we should fight. 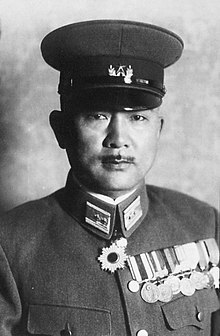 Tadamichi Kuribayashi (Japanese:栗林忠道 Kuribayashi Tadamichi) (1891-07-07 in Nagano prefecture, Japan - 1945-03-23 on Iwo Jima, Japan) was a Lieutenant General in the Imperial Japanese Navy and the commander of Japanese defense of Iwo Jima during Battle of Iwo Jima. His last radio transmission to the Japanese military headquarters. We are sorry indeed we could not have defended the island successfully. Now I, Kuribayashi, believe that the enemy will invade Japan proper from this island. … I am very sorry, because I can imagine the scenes of disaster in our empire. However, I comfort myself a little, seeing my officers and men die without regret after struggling in this inch-by-inch battle against an overwhelming enemy with many tanks and being exposed to indescribable bombardments. … I would like now to apologize to my senior and fellow officers for not being strong enough to stop the enemy invasion. "We are still fighting", Kuribayashi radioed on March 22. "The strength under my command is now about four hundred. Tanks are attacking us. The enemy suggested we surrender through loudspeaker, but our officers and men just laughed and paid no attention." James Bradley, Flags of Our Fathers, p. 245. To his wife Yoshie Kuribayashi. The enemy may land on this island soon. Once they do, we must follow the fate of those on Attu and Saipan. Our officers and men know about “Death” very well. I am sorry to end my life here, fighting the United States of America, but I want to defend this island as long as possible and to delay the enemy air raids on Tokyo. Ah! You have worked well for a long time as my wife and the mother of my three children. Your life will become harder and more precarious. Watch out for your health and live long. The future of our children will not be easy either. Please take care of them after my death. Letter to his wife shortly before the Battle of Iwo Jima. The battle is approaching its end. Since the enemy’s landing, even the gods would weep at the bravery of the officers and men under my command. … [My] men died one by one, and I regret very much that I have allowed the enemy to occupy a piece of Japanese territory. Radio message to Imperial Japanese Army's vice chief of staff. This page was last edited on 9 August 2018, at 10:11.